Serviceable speeds in key locations, an easy-to-use service, and the right privacy promises. Nearly every antivirus company offers a VPN as part of its deluxe security suites. Typically these VPNs are based on white-label services from a third-party such as AnchorFree of Hotspot Shield fame. Avira took a different approach by building its own service called Phantom VPN Pro. Phantom VPN is included for free in Avira Prime, the company’s all-in-one subscription service, but the VPN can also be purchased as a standalone service. Avira offers Phantom VPN at both free and paid tiers. The free service is limited to 500 megabytes per month, but you get most of the same features you do with the paid version. The three things the free version lacks are unlimited bandwidth, an internet kill switch, and tech support. Avira Phanton VPN Pro with an active connection. Avira says it doesn’t collect any information from free users but we still recommend paying for a VPN—especially since the monthly bandwidth is so limited. Phantom VPN has a very basic interface that’s easy enough to use. If there’s one thing that users might find confusing it’s how to select country locations. 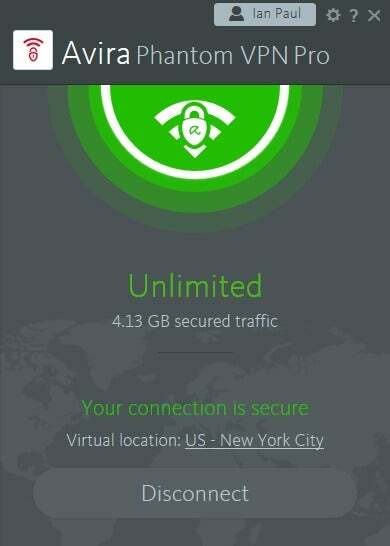 When you first see the dashboard, you’ll notice at the bottom it says “Virtual location:” followed by a link labeled “Nearest location.” If you want to just use the VPN, click Connect, and Phantom VPN finds its closest server to you. Click the link instead itself, however, and it takes you to a list of possible locations under Settings > Select virtual location. Yes, this location list could be easier for users to find. I’d prefer to see a large button that takes you to the list, or a drop-down menu in the center of the interface for choosing servers. One nice thing about Avira’s location list, however, is that it shows the ping time between you and each server location, which can help find the best possible location based on speed. Once you select a location, Avira connects to it automatically. The color scheme of the main dashboard then turns green, and it displays a running total of how much bandwidth you’ve used. There aren’t a ton of extra features in Phantom VPN. There’s an option to use the service’s kill switch under Settings > Block all internet traffic if VPN connection drops. You can choose to launch Phantom VPN when Windows boots, but this is not selected by default. You can also specify that Phantom VPN should automatically connect when your device is on certain Wi-Fi networks. To use this feature, after you’ve connected to a Wi-Fi network, go to Settings > Auto-connect VPN for Wi-Fi networks. You’ll see a list of all the networks your device has used. 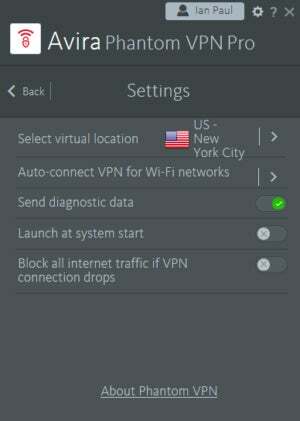 Now click the slider next to the network that you want to use with the VPN, and you’re all set. Phantom VPN Pro costs $78 per year for all your devices, or $71.88 for an Android- and iOS-only subscription. The mobile-only subscriptions are paid via in-app purchase. Phanton VPN Pro’s location listing. Avira supports unlimited simultaneous device connections from a single account, and when you install Phantom VPN it adds the company’s “Browser Safety” add-on. This add-on checks for malicious sites, which most modern browsers already do, and offers tracker protection, ad blocking, and protection against potentially unwanted programs (PUPs) during downloads. Avira’s speeds were unimpressive overall, but as usual that doesn’t tell the whole story. Based on the average from five different locations around the world, Avira Phantom VPN was only able to retain 14.08 percent of the base speed. That’s not great, but individual speeds in the U.S., UK, and German locations were all good, hitting around 20Mbps each. The base speed on the day of testing was 89.60Mbps. With a larger company like Avira it’s not a mystery who’s behind the service. Nevertheless, we’ll go through the details. Avira is headquartered at Kaplaneiweg 1, Tettnang, Germany, and its CEO is Travis Witteveen. Avira says that while using the VPN, it does not track the websites you visit, your real IP address, the IP address you connect to, or any other online information such as files downloaded. It does, however, track “diagnostic data,” which you can shut off at Settings > Send diagnostic data. Avira also tracks whether you’re a free or paid user. The company says it’s important for their “communications to be able to differentiate the two.” It also tracks the total amount of data you use. To sign up for Avira Phantom VPN Pro, it asks for an email address and password. It also asks for your name, country location, and ZIP code. For payments, Avira accepts credit cards, PayPal, and, as of June, Bitcoin and Bitcoin Cash payments via Bitpay. Avira’s privacy policies have most of the right promises, though some people may not like the fact that Avira records bandwidth usage. As for anonymity, Avira’s policies are mixed. It doesn’t track anything you do, but it does want to know your name and your general location. In this, the fact that you can pay with Bitcoin and Bitcoin Cash is a plus. Avira’s Phantom VPN Pro is pretty good. The interface could be a little easier to help users find a specific server location, but once you figure it out it’s fine. It’s a little expensive at $78 per year, and you can definitely find VPNs with faster speeds. You can also find a better service if you want the best possible level of anonymity. What you get with Avira, however, is the comfort of knowing who’s behind your VPN, the knowledge that it’s being run by security experts, and a very liberal simultaneous use policy. If that’s what you’re looking for, then Avira is great. If you are looking for better anonymity, and a wider variety of country locations, then look elsewhere. Avira Phantom VPN Pro is the company's homegrown virtual private network service. It offers an easy-to-use program, and there's no limit on the number of devices you can use with the VPN. 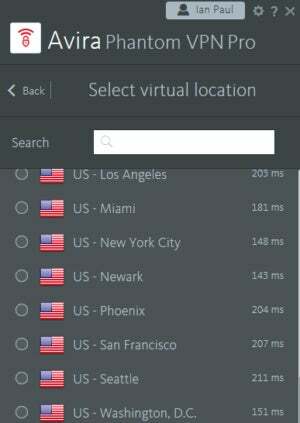 The speeds are fine and the country locations are limited compared to others, but it's a serviceable VPN from a well-known PC security company.